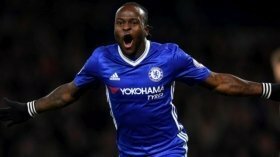 Chelsea have confirmed the departure of Victor Moses to Turkish side Fenebahce on a temporary basis for the next 18 months. The ex-Nigeria international had experienced a tough first half to the season where he managed just two league appearances off the bench and this has eventually urged him to pursue a fresh challenge elsewhere. "Victor Moses has today joined Fenerbahce on loan until the end of the 2019/20 season," a statement read on the club's website. "We wish Victor, a popular member of the squad, all the best on his loan deal in Turkey." Moses has agreed to join Fener on an 18-month loan agreement and the Istanbul side become his fourth temporary club after having previously spent time at Liverpool, West Ham United and Stoke City from the Blues. Aside from Moses, the Blues are expected to tone down the first-team squad further during the forthcoming days with Danny Drinkwater and Davide Zappacosta among those, who could be shown the exit door.